Pierre Bonnard, Paris; sale, Galerie Charpentier, Paris, 23 February 1954, lot L.
The Lefevre Gallery (Alex. Reid & Lefevre, Ltd.), London. John T. Dorrance, Jr., New York (acquired circa 1969); sale, Sotheby's, New York, 18 October 1989, lot 17. D. Wildenstein, Claude Monet, Biographie et Catalogue raisonn, Lausanne, 1979, vol. II (Peintures: 1882-1886), p. 194, no. 1075 (illustrated, p. 195). G. Sieberling, Monet's series, New York, 1981, p. 74. D. Wildenstein, Claude Monet, Catalogue raisonn, Lausanne, 1991, vol. V (Supplment aux peintures, dessins, pastels, index), p. 44, no. 1075. D. Wildenstein, Claude Monet, Catalogue raisonn, Cologne, 1996, vol. III (Nos. 969-1595), p. 407, no. 1075 (illustrated, p. 406). New York, Richard Feigen Gallery, Monet, 1969, no. 23. Tokyo, Museum of Modern Art; Kyoto, Museum of Modern Art, and Fukuoka, Prefectural Museum, Monet, October-November 1970, no. 13. Monet spent considerable time on the Ile aux Orties, nearby to his home in Giverny. He would dock his boat on the island and sit en plein air reproducing the fields, trees, and the river Seine which surrounded him. This "sketch" recalls a brief moment in 1886 when Monet was captivated by the sight of figures silhouetted against the azure sky. He later posed his step-daughters Germaine and Suzanne Hosched, his second wife Alice Hosched (parasol in hand) and his son Michel Monet in the same location to recreate the image which he had found so enchanting. 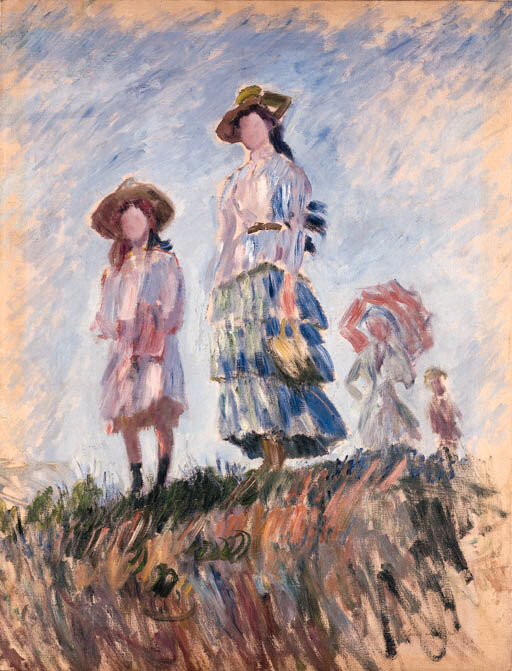 It is interesting to note that the present work is reminiscent of a similar painting that Monet completed over ten years earlier depicting his first wife Camille and their son Jean on a hill in 1875 in Argenteuil entitled La Promenade, la femme l'ombrelle (Wildenstein, no. 381). While the vantage points of the two paintings echo one another, Monet's handling of the atmosphere, light and figures in the landscape differs. His palette has turned to soft shades of pink, blue, lilac and yellow as opposed to the cooler tones employed in the earlier work. Paul Tucker notes, "It is a kind of demonstration piece in which Monet reveals how many ways he can apply paint, render physical forms, and evoke the presence of intangible elements, such as light, atmosphere, and the passage of time" (P. Tucker, Claude Monet, Life and Art, New Haven, 1995, p.124). Monet produced two other works of Suzanne Hosched, a favorite subject, on the same enbankment on the Ile aux Orties--Essai de figure en plein air, vers la droite and Essai de figure en plein air, vers la gauche (Wildenstein, nos. 1076 and 1077).